With shows such as Drunk Shakespeare and ShakesBeer offering evenings of alcoholic consumption and classical theatre in almost equal measure, it would not be surprising to find a brewery developing some manner of marketing tie-in with those productions. After all, when drinking is part of an entertainment, and not the entertainment in and of itself, what more perfect opportunity is there to insinuate your brand into the minds of consumers, especially when their defences are low? So perhaps the first surprise of the recent, brief run of Third Rail Project’s Behind the City, presented in partnership with the whisky Macallan, is how the performance – an immersive theatre work that had attendees hopscotching around Manhattan’s Tribeca neighbourhood – resolutely didn’t invoke the Scotch brand at all. Yes, the event began and ended in a pop-up bar space where Macallan was advertised and poured, but there were no subliminal or overt messages on your eclectic journey of nearly two hours, and even the drinks that were proffered mid-route were mixed cocktails, not shots to be rapidly downed. In the language of commercial marketing, Behind the City – which not so incidentally was offered to audiences free of charge, albeit with a very limited number of tickets available – was branded content. However, in an interview with American Theatre magazine, Zach Morris, co-artistic director of Third Rail Projects was quite clear that he only entered into the relationship with Macallan with assurances that the show he created would not be compelled to market Scotch in its development, creation or execution. Of course, writing anything about Behind the City inevitably mentions the brand. So this column is immediately complicit in achieving Macallan’s goal of associating themselves with a certain kind of entertainment, culture, experience, or whatever you choose to call it. But it is not the only show I’ve seen in recent weeks with a corporate name above the title. Dennis Kelly’s Girls and Boys, featuring Carey Mulligan, a transfer from the Royal Court, is playing a short commercial run at the Minetta Lane Theatre in Greenwich Village under the auspices of Audible, the company that made its name offering audiobooks for download even before podcasting became fashionable. It’s Audible’s second theatrical offering at the Minetta Lane, following a transfer of David Cale’s Harry Clarke, with Billy Crudup, from the Vineyard Theatre, where Audible had provided support for the original production. The endgame for Audible is ultimately to offer these shows, both one-handers, as programming, but like Macallan the live experience stamps the shows with a level of prestige and recognition. After all, the theatre pages of the New York Times don’t typically offer endorsements of alcoholic products or reviews of recorded entertainment. Ironically, this idea of shows presented by consumer product companies, while relatively rare for theatre, harks back to the days of radio and the early years of television, when brands were often intimately involved in sponsoring programming as part of their marketing efforts. It wasn’t surprising to hear that such and such a series was “brought to you by” a single sponsor – and sometimes those sponsors held sway over the content of the shows as well, sometimes resulting, as we later learned, in meddling and outright censorship. 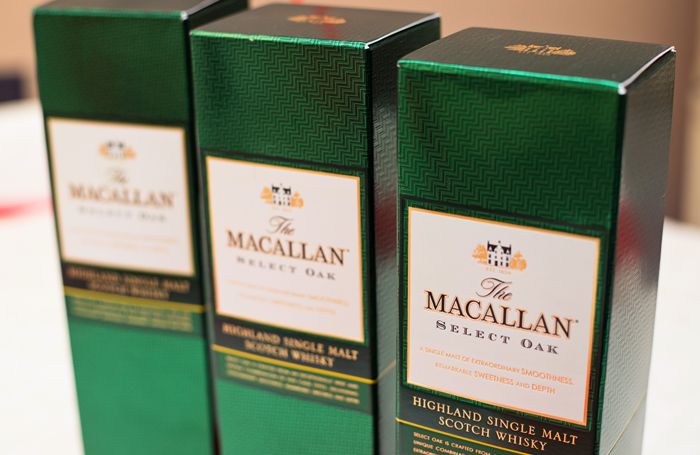 Whether we’ll see more from Macallan, or other consumables, in the theatrical space remains to be seen. But for Audible, its work as a theatrical producer has only just begun. It has commissioned a number of rising playwrights to create new works for the service, and it has taken out a long-term contract on the Minetta Lane as a home for its live ventures, which will include music as well. Audible’s full slate has yet to be announced, but it would seem the studio audiences that were once commonplace on radio, and remain familiar from certain situation comedies on television, will become, at least with Audible’s productions, indistinguishable from theatrical audiences. So long as shows don’t become marketing vehicles, with product placement or content homogenized to reach the broadest audience – which certainly was not the case with Behind the City, Harry Clarke, or Girls and Boys – perhaps these relationships offer a new avenue for theatrical exploration and support. I’ll be watching expectantly for yet more iterations of these platforms and partnerships – and yes, Audible, listening. And while I am a teetotaler, Macallan, I’ll drink to them as well. Multiple actresses take on the title role in Tracy Lett’s Mary Page Marlowe, which looks at the world of the titular character at various stages of her life. First seen at Steppenwolf Theatre Company in Chicago, the new production, opening Thursday at Second Stage Theatre’s Off-Broadway home, is directed by Lila Neugebauer with a cast that includes Blair Brown and Tatiana Maslany.